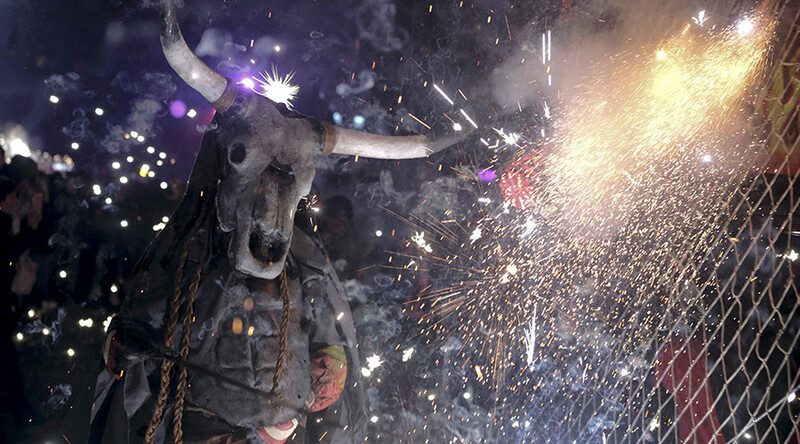 The Spanish cities of Palma de Mallorca and Barcelona drew massive crowds for the spectacular demon-themed ‘Fire Run’ at the weekend. As part of the annual event locals don devil costumes and dart around with sparklers, flares and fireworks while spectators are encouraged to ‘run the gauntlet’. The festival, which has its roots in medieval times, is a high-octane occasion with a constant drumbeat as its soundtrack. While cultural events such as these are often seen as the embodiment of identity for communities throughout Spain, an EU law passed seven years ago threatened their very existence. Brussels passed legislation to curtail use of pyrotechnics and indeed fire at carnivals such as Correfoc, but Spanish lawmakers intervened to scrap the regulations. When you look at last year’s festivities in Barcelona, it's easy to see why injuries remain a risk. Indeed, revellers are advised to keep themselves covered up to avoid burns.